They are actually optic sensors, but if you have to call them eyes, what does my profile picture say? Do I look factory made to you? Has the distinction of being one of the only known Guardians (apart from Shin Malphur) that was not previously dead and as a result: possesses no Ghost but in some mysterious way, still carries the Traveler's Light. "And you say he gave you a "friendly" tour of the place? He did not seem ill-mannered...in any way? Hmm, that doesn't sound like him. Though he does tend to loosen up around that chatty little Ghost and the foul-mouthed Colossus, he is not exactly what I would call a courteous Guardian. Perhaps I should have a talk with him anyway..."
Hello Guardian, welcome to my userpage! 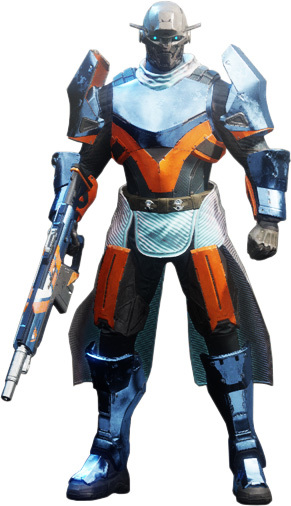 Allow me to introduce myself: I am an Exo obviously—a Titan to be specific (yes I like punching things too, but it's the Hammer of Sol that really convinced me to train as a Titan). Though I cannot recall my real name or most of my past before the crash of my ship a while back, and having no Ghost to resurrect me should I attempt the arcane methods of the Thanatonauts, most of my fellow Guardians have taken to calling me Arcmind. Yes, it is a strange name indeed, but perhaps being one of the Vanguard's chief intelligence sources on the Vex has certain... connotations that come along with it. However I would make one thing clear: though I do posses an inherent fascination with the Vex and their mysteries, my allegiance is to the the Light alone and I will not be swayed from that path. That means don't try and mention me and Osiris in the same sentence, and don't ever try to imply that I am out of whack, because the last Guardian that did... well, I am not going to say. Instead, I'll take that stunned look as meaning you get my point. I will say this: so long as you keep your mouth where your Ghost is, we should get along fine. Now, I have to get back to analyzing this Vex data, so why don't you go back over there and tell Commander Zavala that I did as he requested and gave you a "friendly" tour of the place okay? Good. See, we are starting to get along fine already, now scram! "Hmm, yes? Arcmind? Oh, yeah, I know him. Strange fellow, doesn't seem to understand humor. I guess keeping that unPaired Ghost of his under control is what keeps him dour. One day I'll get him to play cards and we'll see whose laugh—Ikora, wipe that smirk off your face..."